If you prefer a mattress made from natural sources, you will find Brentwood mattresses the ideal choice. Brentwood Home, manufacturer of mattresses for more than three decades in Los Angeles, takes special pride in its products because these are made from natural materials like bamboo, organic latex, kapok, soy wax, organic cotton, and wool. Moreover, Brentwood mattresses are all handcrafted. Summit Mattress: medium feel, high support, 16-inch height, and made of organic latex and wrapped springs. S Bed: firm, made of organic latex and gel memory foam, 11 inch-height, and high support. Finale: medium feel, 11 inch-height, made of Bonnell Innerspring, and has medium support. Bamboo Gel 13: high support, medium feel, 13-inch height. Bamboo Gel 11: medium-to-firm feel, 11-inch height, high support. Posture Plus Eurotop Hybrid: 14-inch height, high support, medium-to-firm feel, and made of gel memory foam and four-zone springs. Posture Plus Eurotop: medium-to-firm feel, 13-inch height, high support, and made of wrapped four-zone springs. Posture Plus: 11-inch height, high support, firm feel, and made of wrapped four-zone springs. Bamboo Gel 10: low support, 10-inch height, plush feel. Bamboo 10: high support, medium-to-firm feel, 10-inch height. Bamboo 8: 8-inch height, medium feel, medium support. Bamboo Gel 7: medium-to-soft feel, low support, seven-inch height. Bamboo 6: low support, six-inch height, medium-to-soft feel. 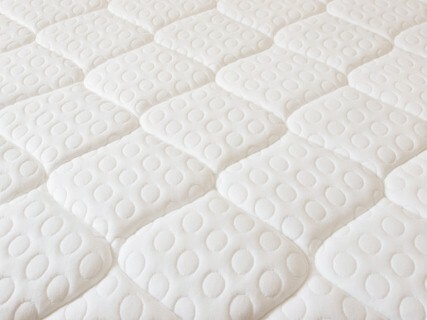 Firmness is essential to any mattress because of the support that it provides for your body while you sleep. Firmness, in fact, is important if you experience pain or aches upon waking up whenever you sleep. Soft mattresses may, to some extent, prove beneficial for those who medical conditions like arthritis. Medium to medium-firm mattresses is a kind of compromise for those who want something in-between. Home 13-Inch Gel HD Mattress – A million gel beads are infused into the three-inch HD Foam Layer of this mattress that keep it cooler and therefore more comfortable to sleep on. This Queen-sized mattress, which measures 60 inches by 80 inches by 13 inches, was manufactured using open cell technology. This allows the easy flow of air through a two-inch ventilated foam layer, plus an extra inch of comfort layer, supported by a seven-inch therapeutic base. This mattress conforms to the contours of your body and provides greater relief to pressure points of your neck, shoulders, and head as well as correct alignment for your spine’s alignment. It has a zippered cover made from all-natural fibers from bamboo that is removable and machine washable. This mattress is resistant against dust mites, is naturally anti-microbial, and hypoallergenic. It can be easily compressed and conveniently rolled for shipping purposes. It also comes with a warranty of 25 years. 10″ HD Mattress – This Brentwood model conforms to your body’s natural curves while you sleep to prevent any soreness in the pressure points on your head, shoulders, and neck when you awaken. Like its 13-inch cousin, this model has a zippered cover made of bamboo’s natural fibers and is removable and machine washable. It also has the open cell technology to allow easy air flow through the mattress to keep it comfortable and cool throughout your sleep. Measuring 60 inches by 80 inches by 10 inches, this model has an HD foam layer that measures 2.5 inches and a therapeutic base for support measuring 7.5 inches. The 10″ HD Mattress helps in reducing the incidence of turning and tossing while you sleep because it does away with motion transfer. Its sleep surface has an all-natural wool layer that wicks moisture – such as sweat – away from your body and regulates your body’s temperature while you sleep. 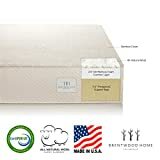 Home 13-Inch Gel HD RV Mattress – Hypoallergenic, resistant to dust mite, and naturally anti-microbial, this mattress model also has millions of gel beads infused into its three-inch HD foam Layer. These gel beads keep you blissfully cool while you sleep, together with the open cell technology which allows easy air flow through the two-inch ventilated foam. Additionally, this model contours to your body’s natural curves and provide relief for pressure points in your neck, head, and shoulders to keep you from feeling sore and achy when you wake up in the morning. This mattress gets rid of motion transfer that helps reduce the typical turning and tossing that awaken you. Measuring 72 inches by 80 inches by 13 inches, this model, like all Brentwood mattresses, comes with a warranty of 25 years and can be compressed just as easily as it can be rolled for transport or shipping. Additionally, its zippered cover, made from bamboo fibers, is environment-friendly. 8-Inch Rest Easy Instant Folding Mattress Foundation – Unlike other foundations, the Queen-sized 8-Inch Rest Easy Instant Folding Mattress Foundation requires no assembly of any kind and yet it is extremely durable with its powder-coated, heavy duty steel construction. This foundation ships in a box that will fit through stairwells, tight corners, and small doorways. Available in California King, Twin, Queen, Full, King, and Twin XL, this foundation can provide your mattress with a stable, flat surface for full support because of its solid construction. Measuring 60” by 80”, it works with any mattress type, fits in any bed frame, and can replace any box spring or box foundation. The slats of this mattress model have been designed close together to give the mattress the correct support. The most interesting feature of this model, though, is that it folds up easily. In fact, you can just remove it from the box, unfold it, and sleep on it after it is delivered to your doorstep. 6″ HD Mattress – Another excellent product from Brent wood Home, the 6″ HD Mattress is also built with open cell technology that keeps it comfortable and cool as air flows easily through its ventilated foam layers. This model is six inches thick with an inch of HD comfort layer memory foam and a five-inch base of support foam. Like its other Home siblings, this model is designed to adapt to your body’s shape to help relieve pressure in your neck, head, and shoulders as well as provide the proper alignment to your spine even while you sleep. This reduces the tendency to toss and turn throughout your sleep since it eliminates the possibility of motion transfer. The environment-conscious will be glad to know that its zippered cover is made from all-natural fibers from bamboo. Those who think memory foams are brick ovens will appreciate this model’s wool layer which wicks away moisture from sweat and regulates body temperature to keep it warm during winter and cool during summer. Because all of Brentwood’s products are made excellently, one will be stumped as to which one to choose when a purchase decision has to be made. Based on the reviews discussed previously, you can choose between gel-infused mattresses and memory foam mattresses. Cool and comfortable come with the former but does it comes with the latter? Yes, it does, because unlike other mattresses, those made by Brentwood have an all-natural wool layer on the sleep surface which wicks away moisture, specifically sweat, and regulates body temperature, meaning your body is kept warm in the cold winter months and cool during the hot summer months. You can say that a Brentwood mattress is highly adaptable. Your choice will typically factor in the price. While each mattress model has a different price, rest assured that you will always get value for your money. Although some customer reviews indicated that a Brentwood model is higher-priced than similarly-purposed brands in its class, you have to consider the materials which have been used in their mattresses: all natural and free from any chemicals. Higher-priced mattresses may have the same features as Brentwood mattresses, so why get one of those when you can get the same benefits from a less expensive model that will fit your budget? Do you know how much is a Tempurpedic bed? It costs as much as a cup of coffee which you will drink every single day for the next ten years. Moreover, Tempurpedic does not manufacture gel infused-memory foam mattresses.